Shane Williams will join prop Craig Mitchell and miss the Ospreys' title push as Wales' record try-scorer is expected to be out for three months. The Wales wing said he suffered his knee injury in a challenge by Luke Fitzgerald in Saturday's 19-13 Six Nations win over Ireland in Cardiff. Mitchell is out for up to three months as he needs "corrective surgery" after dislocating a shoulder against Ireland. And Williams also admitted: "It's eight to 12 weeks out for me." He injured the posterior cruciate ligament in his left knee attempting to hurdle "Colin Jackson style" Fitzgerald in the 22nd minute of their Six Nations triumph over Ireland. Wales and Ospreys record try-scorer Williams and tight-head prop Mitchell will miss the domestic run-in as the Welsh region bid to become the first side to successfully defend their Magners League title. 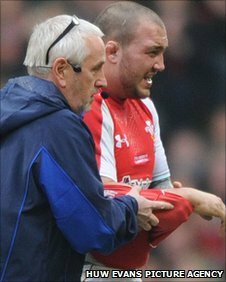 Mitchell left the Millennium Stadium field in pain after 11 minutes on Saturday against the Irish and was replaced by John Yapp. Mitchell has confirmed he will leave the Liberty Stadium in the summer so the 24-year-old, who has been linked with a move to English Premiership side Exeter in the summer when his Ospreys deal expires, has played his final game for Scott Johnson's side. The Ospreys, however, will be boosted that prop Adam Jones has returned from an elbow injury to replaced Mitchell as Jones will start for Wales in their Six Nations match in France on Saturday. Centre Andrew Bishop has also returned to full fitness following an ankle injury but experienced New Zealander back-rower Marty Holah is also out with a rib injury. But try hero Williams' injury will be a huge blow as the 34-year-old, whose Ospreys contract expires in the summer, is a clinical try-scoring threat - scoring a record 54 touch downs for the region - as they bid for their fourth Celtic title. Double Grand Slam winner Williams, who will not undergo surgery, was expected to make his Six Nations swansong in France on Saturday but the injury means his 79th cap against Ireland was his last appearance in the famous Championship. Williams and Mitchell face a race against time to be fit for Wales' first Rugby World Cup warm-up against the Barbarians at the Millennium Stadium on 4 June. Warren Gatland's men then have three friendlies in August before starting their Rugby World Cup campaign against defending champions South Africa in Wellington on 11 September. "I didn't know I had done the injury until Sunday morning when it felt like someone had hit me over the leg with a hammer," Williams told BBC Sport. "We have decided not to go under the knife so it is all about rehab. We're looking between six and 12 weeks out but I have shown I am quite a quick a healer so I'm hoping I can be back a little bit sooner. 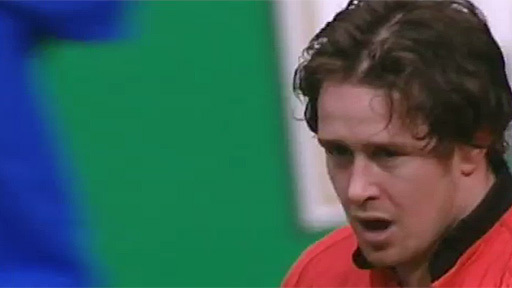 "I'm a little bit disappointed because it was a big year for me for the Ospreys and on the international stage. "I missed nine weeks with a dislocated shoulder and I was just getting back in the swing of things and getting my match fitness back, then this happened. "It is a kick in the teeth. I've got to keep going on and hopefully get back sooner rather than later and getting back on the field. "I must make sure I am sensible in my rehab and come back when I'm ready." Williams, who only returned from two months out with a shoulder injury just before the Six Nations, is now recovering from another long-term injury blow ahead of his planned international retirement after the Rugby World Cup this autumn. The Ospreys wing's last act in a Six Nations encounter was to kick the ball dead at the end of Wales' 19-13 win over Ireland at the Millennium Stadium on 12 March. His tournament tally of 22 tries will remain two short of joint-record holders Scotland's Ian Smith's record and Ireland star Brian O'Driscoll - a feat O'Driscoll equalled at the Millennium Stadium on Saturday. Williams confirmed this will be his final year of international rugby after the World Cup in New Zealand in which Wales face South Africa, Fiji, Samoa and Namibia at the pool stage. And Wales great JJ Williams says his namesake's contribution to Welsh rugby already puts 79-times capped, 53-try Shane high among the greatest of his nation's wings. JJ played alongside Gerald Davies during Wales' 1970s glory years, having succeeded powerhouse Bevan on the left wing and says Shane can also be compared with another predecessor, 1950s star Ken Jones. Davies is widely regarded as the greatest Welsh wing of all time with Bevan also hugely admired and Jones' qualities as an international sprinter unrivalled in his era. "In the professional era he's [Shane] the greatest Welsh wing we've seen," he said. "If he's the greatest Welsh wing of all time, well you can debate that, can't you? I'm not going to say that." But Williams did say: "Gerald Davies, John Bevan, the great Ken Jones, all these guys - they didn't have the influence on a game that Shane has had. "He's up there with the greats and we'll be looking back at his montage of tries over the next 20 years - you'll be going 'wow, look at those tries that guy scored'."